Pioneered by TIG Risk Services, SocialLinkd is a powerful geofencing tool, usually used in tandem with our Internet mining investigations. This practice involves using GPS or radio frequency identification to identify geographical boundaries on a virtual map. 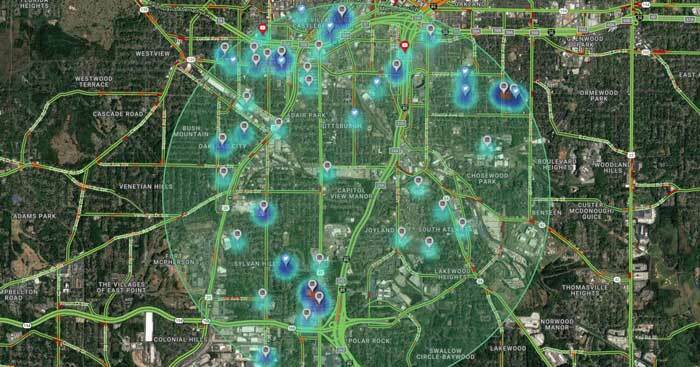 With geofencing, investigators can search for public social media posts that were uploaded within a certain distance of an incident. For example, bystanders might share video or photos of a car accident on social media. Investigators working on insurance claims related to that accident can search for any publicly shared posts that were uploaded within a geographic range set by setting a geofence that aggregates social media posts in the area of the incident. This is a productive and unique way to find photos, video, witnesses, etc. of a particular incident or accident. Recently, we were asked to set a geofence around a state fairgrounds where a catastrophic accident occurred. The objective, to gather any photos taken prior to the accident that would set the scene as well as look for potential witnesses that may not have been added to the incident report. The results were astounding. Although the State Police did a fantastic job of gathering names and evidence, our geofence investigation found a plethora of new photos and video as well as eight (8) new witnesses. On the day of the incident, the witnesses left the scene of the accident because the first-aid and investigation were simply taking too long and that’s only natural. So what are the factors involved that would make geo-fencing a viable tool in an investigation? Population density – The more populated an area, the more of a chance that someone will have posted about the incident. For example, a catastrophic vehicle accident on a busy highway, an accident at an amusement park with hundreds of bystanders, a shooting, or a crime that was committed where others could see what was happening. Incident magnitude – How big is the incident? Take a fender-bender as opposed to a terrible car accident involving a fatality and a medivac. The fender-bender may have data available but the terrible accident, involving the medivac, has more of a chance for people to gather, take photos, comment to friends, etc. Socially friendly environments – Environments where people would use location-based social media posts. For instance, a concert, a marathon, an amusement park, a large construction site, etc. Just think of areas where you would take photos and post them on Facebook, Twitter, or Instagram. Every investigation usually has its own unique twist that makes it different from the others. Only after reviewing the salient variables of an assignment can an investigator decided what services would meet their clients’ expectations. Our SocialLinkd service is no different. Before using any geofencing service, you should have an idea of what information you’re looking for and how geofencing will forward that agenda. Assigning them to every file because it’s new technology will most likely prove futile in most cases. Instead, a targeted approach to geofencing is required to ensure you maximize results. The questions to ask can be found in this post. For instance, was the incident of high exposure? Would the area be heavily populated for one reason or the other? Is the area such that people there would be socially engaged? A yes to any one of the last three questions could be a reason to start a geofence but a yes to all three makes it a must. Subscribe to our Corporate Newsletter to get our educational material as well as deals and promotions.